Who Do You Want to Be? The Nonprofit Version of Comcast or Zappos? Dissatisfied customers are dangerous! They tend to tell more people (15 on average) about their gripes with a particular business or nonprofit than satisfied customers tell their stories (about 11 on average). Just consider the differences between the reputations of Comcast and Zappos. Comcast has cord cutters. Zappos has an expanding customer base. Why? Customer service. Nonprofits typically talk about stakeholders rather than customers. But they are the same, although more complex. A business relationship seems pretty straightforward. The company sells a service or product to a customer in exchange for money. On the other hand, a charity asks stakeholders, such as its donors, for money to provide a service to someone else. The charity serves as the go-between. But donors and the people served are just as much "customers" as the folks who buy shoes at Zappos or cable service from Comcast. Furthermore, nonprofits are more like Zappos, that must compete with a zillion shoe stores, than Comcast, that has a virtual monopoly in many places. There are a million or so nonprofits in the US, and many of them are right in your backyard. Your charity must compete with causes just as alluring as yours. Stakeholder or customer service can help you gain and keep your customers. Who Are Your Customers (AKA Stakeholders)? And What Do They Want? Whether your nonprofit charges for its services or you give them away, how you treat your "customers" is crucial. And they want what any customer does: easy access, personal interaction, solutions for their problems, fast response to their requests and needs, and a heartfelt thank you for their participation. Serving your clients, users, participants, students--whatever you call them--is your organization's reason for existing. Do you have policies in place that guarantee that your employees, volunteers, teachers, trainers, deliverers, program managers all treat your clients with respect and respond to them rapidly? We all know what we expect when it comes to customer service. It's the difference we see every day in our life transactions, such as walking into a store and having someone come up and ask if they can help you. It's the difference between waiting in line at a checkout counter because all the others are closed, and that bank where the line only reaches three people when another window opens. Even if your services are "free," don't doubt that the individuals who use those services deserve and want good customer relations. The one person you ignore could be a future friend or a donor lost. Just think about a hospital. Its patients today may be its donors tomorrow. Not to even mention the many people connected to that patient. All nonprofits depend in good measure on volunteers. They help make your services possible, and they are the most likely supporters of your cause. People who volunteer and have a happy experience tend to be your best donors. What do they want? Easy access. Suitable jobs. Respect for their abilities. A thank you for their help. Good training. Opportunities to learn and add to their skills. Friendship and social interaction. 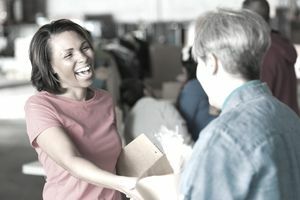 An unfortunate volunteer experience is a nightmare for the person who came in good faith to your nonprofit to offer a hand. Donors are those who give money or assets to your cause. A donor might be someone who leaves your organization a million dollars in his or her will, or it could be that person who donated $10 online. Donors are foundations that give you grants, and corporations that sponsor your events. They are the people who give their clothing and furniture and books to your thrift store and the lawyer who contributes pro bono services to help keep you in business. All donors want to be appreciated and thanked. And the quicker, the better. They also want to be able to find the right person to talk to when they have a problem, or they want to set up a scholarship fund, or partner for a cause-marketing campaign. Donors want to know how their donation made a difference in someone's life, and that you spent their money wisely. Donors want to be thanked. They wish to hear from you on a regular basis but not every day. They want to hear good news stories as well as about dire needs, and they want to be able to give in a multitude of ways that are convenient and quick. Make improving your relationships with customers an organizational goal. Start by thinking about all of your "customers" and what they might want. Ditch the old term of "stakeholders" and start thinking about customers. The term stakeholder is so abstract. But the word customer rings with associations, good and bad. We know how to do customer relations because we are all customers and know what we like and hate. So, do you want to be Comcast or Zappos?